I just got this great travel/running belt from Amsana. This is a great little organizing belt. You have a clear pouch in the front perfect for your phone or ID. You can still use your phone inside the pouch, you can see if you get a message, etc. On both sides there are zipper pockets that can be used to store other items like your keys, money, whatever you might need. It fit really well just uses a clip to close. Adjustable so it fits a variety of sizes. Made of really great materials that are water resistant and breathable. Seaming and stitching are all done well no tears, holes, unraveling. 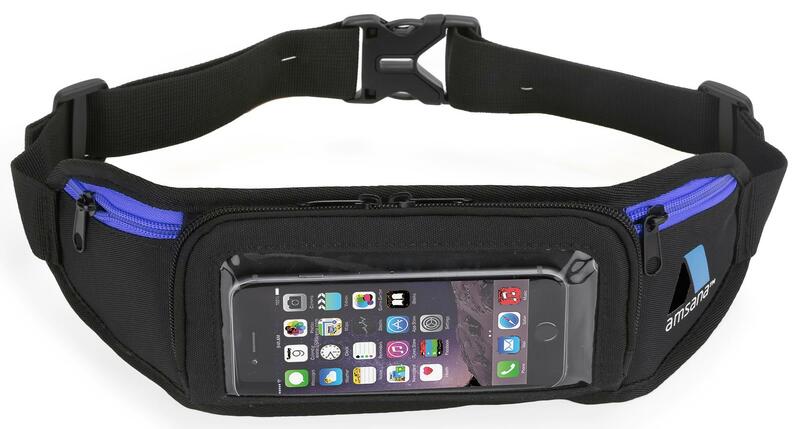 A great way to be hands free when you are walking, running, working out, or out traveling. ONE SIZE FOR ALL – This belt is adjustable up to 42″ to fit men and women of all ages. One belt for all your family members! 4 COMPARTMENTS – 2 large pockets for your smartphone, money, passport and boarding passes and 2 smaller ones for your keys, change, or medication. KEEP YOUR BELONGINGS SAFE AND SECURE -The belt has three zippered compartments and a special safety pocket with Velcro closure so your phone won’t fall out while taking out your other belongings or documents. CLEAR PROTECTIVE WINDOW – Allows you to view your calls or messages while running or waiting on line. SUPER COMFORTABLE- The material of this waist pack is highly breathable and comfortable to wear even on the hottest day in the summer or coldest day in the winter.